One question I often get asked by clients is what sort of laptop they should bring on a photography expedition. Some have elected to use systems very similar to mine, but there are in fact many choices. 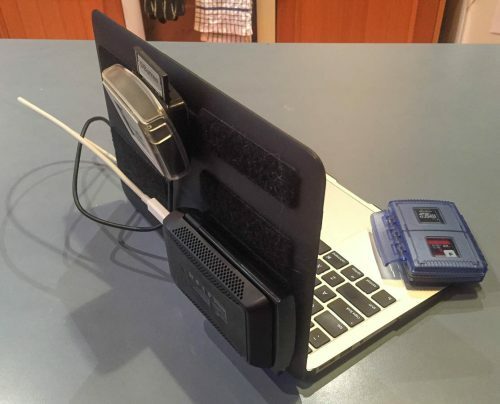 For a long time my main computer was a 15″ laptop which I connected to an external display and lots of storage when at my desk. It wasn’t the smallest machine for travelling with, and it was also in need of an upgrade, so eventually when I upgraded it I ended up with two machines. One a workstation for my desk (a monster which now has 3 displays, lots of CPU and RAM, and more than 16 TB of storage), and one a tiny MacBook Air. The combination of two machines has worked very well for me. The MacBook Air I have is an 11-inch mid-2012 model. Since then the updated models have increased CPU power and internal storage, but are otherwise basically the same design. But with new updated MacBook Airs from Apple apparently imminent, it’s possible that some of the options will change. So it seems opportune to identify the features I find useful in a portable machine, so that new machines can be compared with this list. My machines all run Apple’s OS X, but Windows users will have have similar requirements. My 11″ MacBook Air doesn’t even take up space in my carry-on luggage when flying. It fits in the “iPad” pocket of my ScottEVest Travel Vest. This is especially useful as the Gura Gear Bataflae 26L camera bag I fly with doesn’t have a laptop compartment. Many bags do have laptop compartments, and the MacBook Air (even the 13″ model) will of course fit in any/all of them. During expeditions I regularly (often several times per day) download and backup photos, get Adobe Photoshop Lightroom to render previews, and do a lot of initial processing (keywording, rating, even cropping and some developing). Reviewing and sorting your work during the expedition lets you make better use of the next photo opportunities. Occasionally I will even stitch some panoramas during a trip. My machine’s 2 GHz dual-core i7 and 8 GB RAM copes with this, although more than 8 GB would have been nice. Maybe the next machine will offer 16 GB? I need to download gigabytes of photos, and still more gigabytes are used in the Lightroom catalog which manages those. I keep the catalog on the internal SSD due to the huge speed advantage of this. My current machine has a 250 GB drive, but this doesn’t give me enough room to also store photos/videos there. So these are currently stored on a 500 GB USB3 SSD which is attached with Velcro to the back of the machine (which means I can pick up the machine and walk around a campsite without worrying about the USB3 cable being pulled out). The internal drive needs to have enough space for the operating system, programs, my home directory with various mail/music/etc storage, the Lightroom catalog, and enough free space that I will never get a lockup with software complaining it’s run out of space. There are larger options than 250 GB for internal storage (which are cheaper now than when I bought the machine) and there are even third-party upgrades available up to 1-2 TB. But it’s all a cost/convenience trade-off. On my previous 15″ laptop I was able to remove the DVD drive and replace it with a second internal hard drive for expanded storage. But this option isn’t available with the newer super-slim machines. On most of my expeditions in recent years I have been bringing back 400+ GB of new files. As cameras produce bigger and bigger files this will of course grow, and I presume I’ll have to upgrade that 500 GB drive at some point. The 11″ MacBook Air has two USB3 ports and one Thunderbolt, which works very well for me. With one USB port used up by the SSD that’s holding my photos, the other one is free to connect the card reader I use to import the photos. Some machines have internal SDHC/SDXC readers which can be useful for some people, but my biggest and fastest cards are CompactFlash, and I need external readers. I use a Lexar “dual-slot” reader and a Kingston USB3 reader (sometimes individually, sometimes via a tiny USB3 hub: all attached to the machine with Velcro). My download software (my own command-line tool) can import from multiple cards at the same time which really helps with quickly downloading 60 GB of new files: at times the transfer rate from the cards to the SSD exceeds 160 MB/s. Tiny Windows machines such as the Microsoft Surface fail this test immediately. They only have one USB port! There’s not enough storage to have the photos stored internally (remember, I shoot everything in RAW) and if you connect an external drive you can’t connect the card reader at the same time (well you could with an external powered hub, but that’s not a very portable system). Then when the files are copied to your drive, you need to make a backup. Files don’t really “exist” until there are AT LEAST 2 copies. I don’t format any memory cards until the backups have been made. So now you need to be able to connect two drives at the same time. I use the Thunderbolt port for this. I have a Seagate GoFlex Thunderbolt adapter which connects to any of the external SSDs or hard drives I travel with (the SSD that’s storing the primary copy of the photos is using a GoFlex USB3 adapter) but I usually have it fitted with a 1 TB drive which is partitioned so there’s a bootable clone of the laptop’s internal drive, a Time Machine partition containing updates since then, and a partition containing synchronised copies of the image files and of the Lightroom catalog. I also have a second backup drive (giving me 3 copies of everything) which I connect less often, and after its files have been synchronised to match the primary storage, it sometimes travels in a colleagues luggage to reduce the risk of a catastrophic loss of data. With all these ports I’m able to connect the primary storage drive, the card reader(s), and the backup drive, then tell the machine to download and backup two whole cards while I’m free to do something else (such as change out of my wet-weather gear, grab some food, help workshop participants, etc). So for me with current technologies, one USB3 port is unusable. Two is OK. More is nice. They’re currently even running the same version of the OS, so no problem there. Some of my clients have Windows desktops and OS X laptops, but even there most software is available on both platforms. This makes the machine useful for so much more than just downloading and backing up photos. The 1366×768-pixel 11″ display is small, but large enough to run all the software I need in the field. On big projects I’m more productive with more space, but that’s what my desktop machine is for. 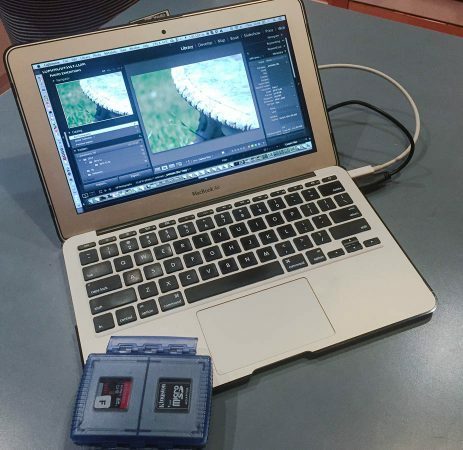 Some people prefer something larger like the 1440×900 13″ MacBook Air (which also has an internal SDHC/SDXC card reader but is otherwise identical). These screens aren’t comparable to the large IPS panels on my desktop machine, but after calibration they’re in fact good enough for most photo processing in the field. Future laptops may have displays with more pixels in the same area (e.g. “Retina” displays) but this will have to come along with matching upgrades in CPU speed, RAM, and battery life. Depending on what I’m working on, I get from 2-8 hours out of each charge. Incidentally, the laptop’s charger is multi-voltage so works around the globe, and has a standard IEC 60320 C7/C8 “figure-8” power connector (the same as used by my Canon battery chargers) which means I can share power cables/adapters with my other gear. I think that’s most of the major points. Think about which of these issues is important to you (most of them should be) and hopefully this might empower you to make sensible decisions about your next portable computer!